Once again I’m about to get honest here. Sometimes it hurts so much that I can’t give our son a sibling that I want to just curl up in a ball in bed. Sometimes it hurts so much that I can’t get pregnant that I want to just check out on life for a couple hours and wake up when everything is better. My heart literally aches when I look at our little guy and see him playing all alone. I am so incredibly thankful for our son. I honestly think that what we have been through makes me treasure him and moments with him more than I would have if pregnancy came easily to me. I still look at him with wonder and I frequently tell him how glad I am God gave him to us. How do you live in a painful reality while still being intentional with the child/ren that you already have? I don’t have all the answers on this. In fact, I only have a few scattered thoughts and it’s nothing revolutionary. First of all, it is ok for there to be pain. Feeling pain does not mean that you are not right with God or that you need to repent. When you feel that pain, it is ok to pour it right out to God. He already knows anyway. Some days will likely be worse than others. And that’s ok.
Life doesn’t stop because of my pain though. And I don’t want to look back and realize I missed out on my son’s life because I was so stressed out while TTC. Being intentional isn’t really a huge grandiose production that you need to do. For me it is sometimes as simple as sitting next to my son on the couch and watching Curious George with him. Go in the back yard and throw some balls. Throw them high in the air, throw them as far as you can, throw them to each other, throw them a couple feet away and run to catch them…..be creative. Don’t save your intentional time for only the days you feel depressed or discouraged (although by all means definitely do it on those days too!). Have fun with your children. Remind yourself how much you prayed for them. Obviously my only experience is with a toddler. There are lots of great blog posts out there with ideas for older children as well. This one lists 101 things you can do with your children with ideas that would apply for older children. 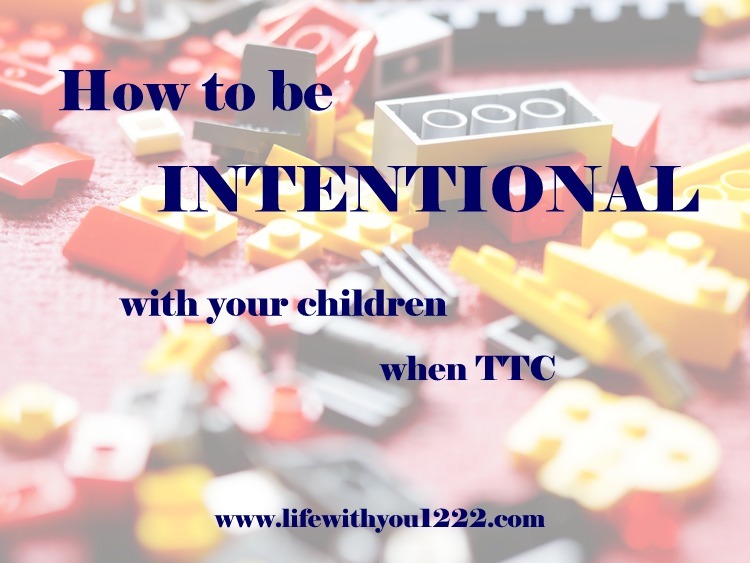 What are some ways you have spent time intentionally with your children?